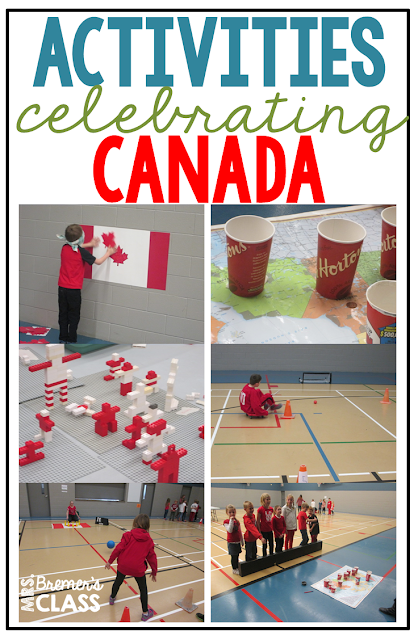 Mrs. Bremer's Class: Celebrate Canada! To launch our study about Canada in Grades 1-3, the Grade 8 teacher and some grade 7 & 8 students put together a morning of FUN activities to help us get excited about CANADA! Students were blindfolded and spun around a few times. Then they had to try to put the leaf in the correct spot on the flag. Students had to toss coins into the Tim Hortons cups. The total amount of coins that the group got inside the cups were tallied. It just wouldn't be a celebration about Canada without some hockey! Students took turns taking shots on net, and the accumulated goals per group were compared. Using red and white Lego, students built Inukshuks at this station. Students had to scoot around the pylons and take a shot on the net with a hockey stick and ball. The groups worked together to knock over as many pins as they could, and group totals were compared. At this station, students did a Canada-themed word search as well as filled in the blanks to our national anthem: O Canada.